Solution: Suppose you had a balloon made of some highly flexible semipermeable membrane. 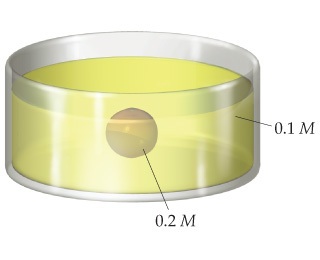 The balloon is filled completely with a 0.2 M solution of some solute and is submerged in a 0.1 M solution of the same solute: Initially, the volume of solution in the balloon is 0.25 L. Assuming the volume outside the semipermeable membrane is large, as the illustration shows, what would you expect for the solution volume inside the balloon once the system has come to equilibrium through osmosis? Initially, the volume of solution in the balloon is 0.25 L.
Assuming the volume outside the semipermeable membrane is large, as the illustration shows, what would you expect for the solution volume inside the balloon once the system has come to equilibrium through osmosis?